Japanese role-playing games are a funny lot. I sometimes struggle to articulate why I love them and their more esoteric qualities, or how I can overlook their pandering. There are many I don’t care for. But when they get it “right”, there’s no other genre I find quite so gratifying. At their best, they turn the hoary old tropes of the hero’s journey into something both emotional and epic; the mundane reality of battle into super-heroics. They shift radically in tone so seamlessly it leaves you wide-eyed in awe rather than suffering from whiplash. There’s a sense that anything could happen. I want to talk about one of the best examples. You won’t find it on Steam, Uplay, Origin or any other digital storefront. But it has been around for almost five years, with an authorised English translation, even though it never officially launched outside Japan. It’s a (deep breath) free-to-play game, funded by micro-transactions, designed for smartphones but – bear with me – playable in an internet browser. It’s called Granblue Fantasy. 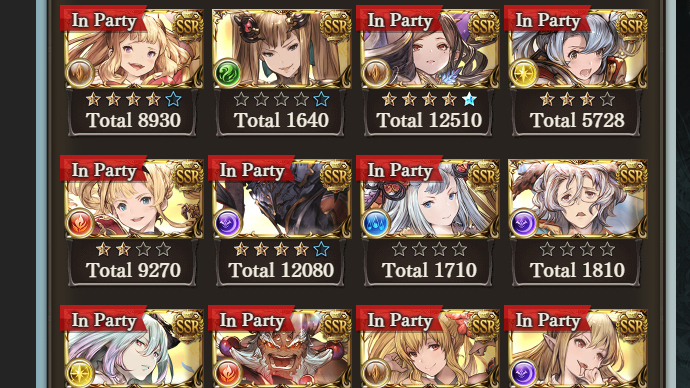 Granblue Fantasy was launched in 2014 by Cygames, a studio best known in the west for the collectible card game they released a couple of years later, Shadowverse. Granblue was their first project to seriously take off. Early interviews see the staff talking about the game as a concerted attempt to capture the glory days of the JRPG genre on a smartphone. They hired composer Nobuo Uematsu, famous for multiple Final Fantasy games, and artist Hideo Minaba, who worked on Final Fantasies V, VI and IX as well as the Xbox 360 exclusive Lost Odyssey. Anyone who’s got even a passing familiarity with the genre will recognise the basic plot beats. A youthful protagonist and their talking animal sidekick, abandoned by a father with a shadowy past, meet-cute with a mysterious girl who saves them from certain death when they step in to help her. There’s an evil empire hot on her tail, because of course there is. The backdrop of flying ships and islands floating in the sky brings to mind Sega’s cult favourite Skies of Arcadia, as well as the girl’s connection to the enigmatic precursor race who wandered off the stage many years beforehand. To temper your expectations still further this is a game designed to run on as many low-powered devices as possible, the better to maximise its player numbers. There’s no exploration, no open world; you move from menus to flip-book story scenes to battle sequences and back again. And yet those PR interviews weren’t just fluff. For all the technical simplicity of the presentation style (simple 2D sprites, static illustrations, many of them repeated ad infinitum) the art is frequently gorgeous. Uematsu’s score, along with Tsutomu Narita, is a marvel, easily surpassing virtually anything else he’s produced to my ears. The 2D also bears mentioning inasmuch as a great deal of effort has clearly gone into investing these little figures with as much life as the style allows. Watching your heroes perform their attacks is frequently every bit as entrancing as the art in Vanillaware’s Odin Sphere, or SNK’s Garou: Mark of the Wolves. The battles are your standard line-dancing setup, where you put together a party, then you and your opponents take it in turns to attack. A maximum of four characters sit up front, with two in reserve. Each character has from one to four skills on call, any or all of which can be used in a turn if they’re available. Those characters’ innate statistics are bolstered by your “grid”, which is the selection of weapons you’ve collected, along with a deck of magical beasts to summon. You can have up to five summons by default, and a sixth slot for a rental from some other player. A well-worn template, perhaps, but there’s depth to all this: tougher fights ebb and flow to thrilling effect as enemies get increasingly desperate. Individual heroes vary so much that putting together the right party to take down a particular foe can be just as engrossing. Should you reattempt the harder battles they can, and will, play out differently. You will, admittedly, be re-attempting some of them. 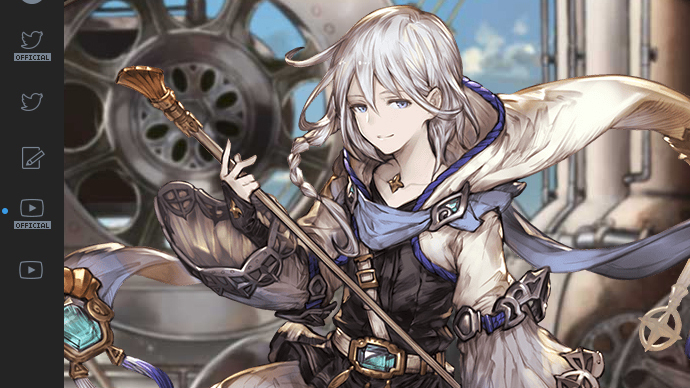 I talk as if Granblue were a single-player game, but it is ultimately always online, designed to ‘maximise engagement’ or whatever buzzword you prefer. There’s no real player versus player mode, so few reasons to try to outdo your friends, but you are expected to grind. That being said, I found it pleasantly soothing to farm resources with a podcast in the background. It struck me as far less onerous than, say, the four hundred hours I spent in Guild Wars, or nearly two hundred in Path of Exile. And anything in Granblue which requires that sort of time investment is emphatically optional. 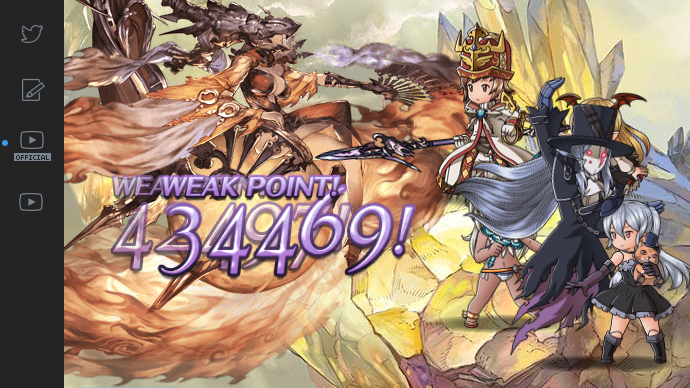 What really sets Granblue apart, though, is something else entirely. Many beloved JRPGs take these clichés, these tried and tested mechanics, and forge them into something arguably greater than the sum of its parts. There’s a joyful spirit of adventure and a can-do mentality about much of the genre. Tragedy might befall the heroes, but the survivors will always try their hardest to struggle on. Virtually everybody gets a second chance. 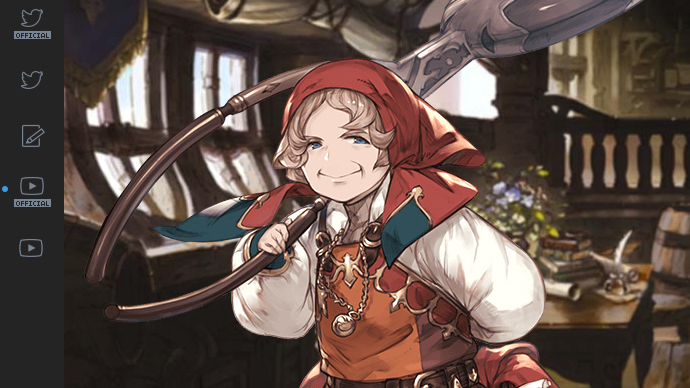 Done right all this can seem laudably childlike, rather than childish, and Granblue’s main story nails it from the word go. Taking to the skies carries the same thrill as it does in Skies of Arcadia, for all that Granblue is text and static illustrations. The text does a surprising amount of work in selling the illusion. While some of the older content is still poorly translated, the two main plot arcs and many of the newer side stories are terrific. The narrative hits some real high points, from action set pieces to quieter character moments. The majority of the expansive cast are likable, credibly flawed, and their efforts to overcome those flaws are a joy to follow. It bears noting that it’s not merely a case of good storytelling. Cygames have, in my view, one of the best localisation teams in the business, juggling many different voices with consummate wit, flair and comedy that’s often very funny. The writing is also surprisingly subversive. Both genders are equally capable. Two prominent characters are trans, even, and neither is treated with derision. While there is fan service it rarely, if ever, stoops to lengthy male gazing and women are catered for as well. Religion is never the cheap gag the genre so often relegates it to. Yet Granblue does get problematic at times. Some of the fan service is a lot harder to excuse when the average player is apparently forty-plus and male. While queer-coded characters are sensitively handled there are, notably, no actual gay men. And there’s very few people of colour, apart from a handful who veer into eye-rolling stereotypes, for all their charm. The game is designed to be played in portrait mode on smartphones, so looks like the above if we don’t crop the screenshots. The free-to-play model deserves some of the criticism, though it’s less problematic than you might expect. While it uses a stamina gauge to govern how often you can play, the game doles out so many refills I can’t remember ever being forced to wait to continue. Fail any tough fight and you can easily return, first doubling, then quadrupling your stats should you wish. Yes, you can pay for more chances in the lottery to obtain new characters, or to skip the grind. That may prove too much for some, but I finished the story content without spending a penny, and never felt pressured to do so. If the payment model is a deal breaker for you, there’s comfort in knowing the Granblue world is not joined to freemium at the hip. Two new games are set to launch later in 2019: Relink, an action-oriented RPG developed (until last month) in co-operation with Platinum Games (Bayonetta, Vanquish, NieR: Automata), and Versus, a 2D fighting game from Arc System Works (BlazBlue, Guilty Gear). Along with an English release, Cygames have explicitly said they’re considering bringing both of these games to Steam (currently only the PlayStation 4 has been confirmed). I could hardly be any more excited. Early footage of each strikes me as hugely promising. 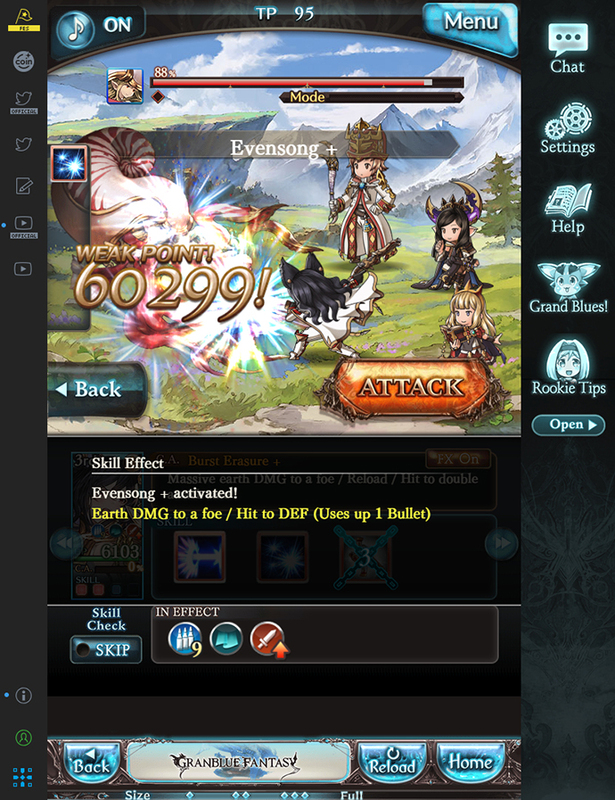 Yet I still keep coming back to Granblue Fantasy itself. I suspect it relies too much on pleasing its core audience to sway many people who see the genre as intrinsically pandering or distasteful. But I’d argue it’s still a fantastic piece of storytelling, an old-school grand adventure as captivating as any Suikoden, Breath of Fire or Dragon Quest, let alone what’s currently distributed on digital storefronts. There’s more than enough game there, too, to make the player feel they’re not just reading a book. It may not be free as in gratis, but it’s still a remarkably generous game. If you have any interest in the genre, I urge you to consider joining their ranks. If you do decide to try it out, there are official instructions here for how to download the Chrome browser extension and how to create an account afterwards. After the account creation process, the whole game can be switched to English. Tagged with Cygames, feature, Granblue Fantasy, review, Granblue Fantasy.